Available for all functions throughout the North East and the rest of the UK. 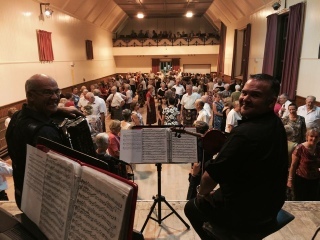 The Great North Ceilidh Band and Disco will provide top class entertainment tailored to the occasion. 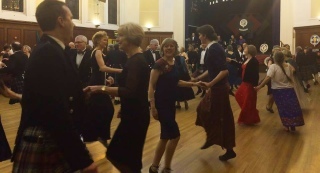 Don't worry if you've never been to a ceilidh - We quickly talk you through the dances beforehand and our professional 'Caller' guides you along as the music plays. We can provide anything from Robert solo or two, three and four- piece bands as required to fit in with your budget. Live performances regularly take the band to Shetland, Portugal, Cyprus, USA, Ireland and more recently Uganda! Robert also clocks-up more than 50,000 miles a year in the UK playing for Dances, Festivals, Concerts, Ceilidhs, Accordion Clubs, Folk Clubs, Weddings and other private functions. The addition of the fully-equipped disco now means that everyone is catered for. Music of your choice can be played throughout the evening or after the dance. Born and bred in the beautiful border county of Northumberland, Robert has been playing the piano accordion since his schooldays and although competent in all musical styles he specialises in Scottish Country Dance Music. His appearances at Shetland and other major festivals, accordion clubs and radio broadcasts are testimony to the respect he has earned in the business. He regularly features on BBC Scotland's 'Take The Floor' and was the first Englishman ever to win the Senior Scottish Traditional Accordion Championship in Perth. Robert was Vice-Chairman of the Alnwick Northumbrian Gathering which attracts musicians from far and wide to take part in concerts and competitions. As well as his own records and CDs, Robert has played accordion in several line-ups and on many professional productions; including albums by Ewan Carruthers and Jimmy Powells. He is available for bookings either as a soloist for small functions and session work or with his own Danelaw Country Dance Band, a band he established in 1969. Robert is from a musical family with his two sons Christopher and Graeme continuing the tradition and joining him on various projects. Robert is probably the best known 'Scottish' accordionist in Northumberland.